WASHINGTON (AP) — Republican presidential candidate Mitt Romney has said he had no active role in Bain Capital, the private equity firm he founded, after he exited in February 1999 to take over Salt Lake City's Winter Olympics bid. But according to Bain associates and others familiar with Romney's actions at the time, he stayed in regular contact with his partners over the following months, tending to his partnership interests and negotiating his separation from the company. Those familiar with Romney's discussions with his Bain partners said the contacts included several meetings in Boston, the company's home base, but were limited to matters that did not affect the firm's investments or other management decisions. Yet Romney continued to oversee his partnership stakes even as he disengaged from the firm, personally signing or approving a series of corporate and legal documents through the spring of 2001, according to financial reports reviewed by The Associated Press. The details of Romney's contacts with his Bain partners between his 1999 departure and his separation from the company in mid-2001 could show how involved he was — either as CEO or passive investor — in several multimillion-dollar investment deals, bankruptcies and a spate of layoffs and overseas job shifts at Bain-owned companies that reportedly occurred during that span. Romney's role became a campaign issue in recent weeks because corporate records from the time showed his interests in some of those deals — despite his insistence that he gave up any decision-making authority once he left Bain. "When partners depart a private equity company and are no longer active, there are various ways that their interests may be affected," said Colin C. Blaydon, director of Dartmouth University's Center for Private Equity and Entrepreneurship. "In some cases it may not be affected at all, but they still own points in the funds and the carried interest that is paid as part of their partnership stake. It's entirely possible to step back from a previous management role, but that all depends on the arrangements they make and the management structure created to replace them." A clear accounting of Romney's contacts with Bain has been hampered by his presidential campaign's reluctance to discuss the period in detail and complicated by conflicting accounts in some of Romney's comments and financial reports. Both the Romney campaign and Bain have declined to provide documentary materials that could shed light on Romney's role after 1999. Romney's campaign says that once he agreed to head the Olympics bid, he was no longer "involved in the management of that business or the investment decisions that occurred." Campaign spokeswoman Andrea Saul added that "it took some time to transfer his ownership to the other partners, which is not surprising given the growth and success of the firm." Romney testified during a 2002 Massachusetts court case that he flew back and forth between Boston and Salt Lake City frequently in the first half of 1999, returning at least four times to attend board meetings of office supply giant Staples Inc., which had named him a director. Romney said nothing about his dealings with Bain during that testimony, which came during a legal challenge to his Massachusetts residency that was aimed at thwarting his campaign for governor. Several associates now say that Romney made repeated trips between Salt Lake and Boston, where he met at times with his former partners, mostly to discuss his severance from the firm. The Boston Globe reported last week that Romney also met with his Bain partners at a 15th anniversary celebration in Palm Beach, Fla., in early 1999. "Some were group conversations. Some were one on one," said a legal expert familiar with Romney's discussions with his Bain partners. This person, who spoke on condition of anonymity to discuss confidential business dealings, said that Romney did not relinquish his Bain ownership after taking the Olympics role but that Romney took care to avoid the day-to-day role of a corporate manager. This person said that when Romney left, a five-partner management committee was already in place. That account echoed a similar version given by Edward Conard, a former Bain partner who donated $1 million last year to a political committee supporting Romney's presidential run. "There was a management committee running Bain to transition from Mitt to a new structure," Conard said last week during an interview on MSNBC. 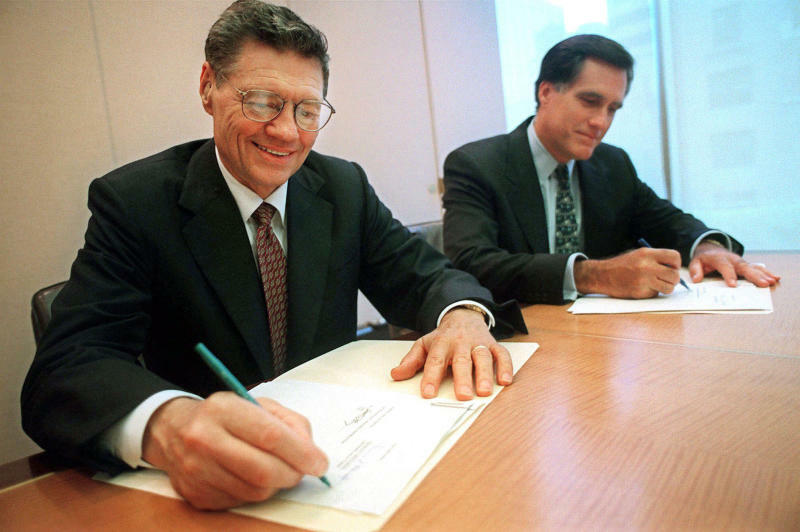 At the same time, Conard said, Romney's exit was complicated by the fact that "Mitt's names were on the documents as chief executive and sole owner of the company." Those documents, filed with the Securities and Exchange Commission, contain dozens of references to Romney and his holdings. An AP analysis of thousands of SEC filings in that three-year period found at least 39 documents in which Romney was listed as sole shareholder, president or director of investment funds that controlled large stakes in Bain-related companies. Some legal experts said those records show that Romney remained the "controlling person," as some filings described him, in the deals that Bain struck in that span. "From a corporate law point of view, it would not be kosher to hold him out as president when he had no role in the company," said George Washington University law professor Arthur E. Wilmarth Jr.
Other experts cautioned that while federal "beneficial ownership" rules require the listing of partners whose voting stakes exceed 5 percent of an investment in a public company, any partner with voting power in the same investment could also exercise authority. While Romney controlled the management entity running Bain, his partners controlled connected general partnerships that directed the investment funds. As a result, Romney was not the only Bain partner with lines of authority over the investments cited in the SEC filings. "Anyone who has voting power over the shares could be the owner for reporting purposes," said Brian J. Lane, a partner at the Washington law firm of Gibson Dunn and former director of the SEC's Corporate Finance Division, which oversees corporate filings. In addition to those SEC reports, other corporate documents obtained by the AP show Romney's personal signature at least 10 times on large stock transactions or ownership statements tied to Bain investment deals at the time. Those documents include Romney's signature on federal stock forms approving the sales of large stakes in circuit board manufacturer DDi Corp. The company went into bankruptcy in 2003. SEC filings by Bain also showed that Romney's digital signature— a legal version of his personal script — appeared on at least 18 other stock ownership records between 1999 and 2001. The filings were part of Bain investments in Therma Wave, a heat testing company; Wesley Jessen Visioncare; and Staples Inc.
Romney's defenders argue that such signings reflected his limited role as a Bain partner and investor, but not as the firm's manager. One former senior Bain partner said that once Romney had accepted the Olympics position, he would "make suggestions but not decisions." The former partner added that Romney's extensive partnership stakes required him to respond to — and at times approve — a succession of ownership documents stemming from the company's continuing investment deals. Documents reviewed by the AP also showed that Romney signed several power-of-attorney statements that were used repeatedly during the transition, allowing other senior Bain partners and several lawyers for Bain to represent his interests in the investment deals the company struck between 1999 and 2001. Blaydon said such moves are common in private equity deals and also could have provided Romney with legal flexibility as he moved to disengage from Bain. "If he wanted to dial in by phone, he could have," Blaydon said. "There's no doubt he could have played a bigger role if he wanted, but if he wanted to have minimal involvement, he had that flexibility." Other private equity experts questioned whether Romney's continuing financial stakes could be so easily separated from his longtime CEO role. Victor Fleischer, a University of Colorado law professor and private equity expert who urged corporate tax code reforms during congressional testimony last year, said Romney could not simply waive his duties as Bain's CEO and major shareholder. Many of Bain's investment funds and several of Romney's own managing partnership entities were based in Delaware. Fleischer said the state's corporate code required that the fund manager "perform whatever partnership duties they have with the greatest attention. He was still president, CEO and sole shareholder of some of the management companies for some of these funds, and under Delaware law, owed fiduciary duties to his investors. If you can't fulfill your fiduciary duties as owner, you have to waive your partnerships." Charles M. Elson, a University of Delaware finance professor and an authority on the state's corporate laws, countered that Delaware law "is flexible enough to give (Bain) leeway in their decision-making. The partnership law is enabling. They could make decisions without him." Even Romney's explanation of his role at Bain after 1999 appears to have shifted in recent years, as shown in notes that his financial trustee provided in successive presidential candidate financial reports submitted in 2007 and in 2011 to the U.S. Office of Government Ethics. The lawyer administering Romney's finances, R. Bradford Malt, said in 2007 that Romney did not have "any active role with any Bain Capital entity" after 1999. In 2011, that explanation broadened, saying Romney had also "not been involved in the operations of any Bain Capital entity in any way." Both explanations appear at odds with statements attributed to Romney in a corporate press release from July 1999, five months after he left to take over the Olympic bid. The press release, recently posted on the Daily Kos website, announced the departure that year from Bain by two of Romney's founding partners. The release also stated that Romney remained Bain's CEO while on a "part-time leave of absence" to head the 2002 Winter Olympics in Salt Lake City. D'Jamila Salem, a former Boston public relations executive who authored the press release, recalled recently that Bain officials provided the quotes and information about Romney at the time. Salem was listed on the release as a press contact along with Joshua Bekenstein, a founding Bain partner. Bekenstein also substituted at times for Romney on SEC filings under power of attorney during that period. Bekenstein, still a Bain managing director, was one of several company executives who did not respond to calls from AP for comment. Associated Press writers Charles Babington and Andrew Miga in Washington and Steve LeBlanc in Boston contributed to this report. EDITOR'S NOTE _ An occasional look at political assertions and how well they adhere to the facts.